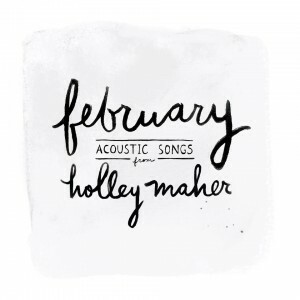 I produced this EP, from my good friend and ridiculously talented artist, Holley Maher. JT, since when are you producing? Um, I’m not. I tried to explain that to Holley when she asked me to do this, right after Christmas, but she didn’t want to hear it. In her defense, I have been quietly acquiring both the equipment and the skills to do some recording in my studio. Holley, as with most of my Nashville friends, has come over to demo new songs with me. And when she told me what she wanted (just a few songs done with a one-mic/one-take style, something really honest and organic), it sounded totally doable. It’s also a personal motto of mine to always say yes to interesting projects. Which is how stuff like this happens. When she showed up the next day, she said, “Hey, I was thinking…” which, even in my limited producer experience, I knew was a statement that was going to mean more work for me. “…that instead of doing the songs in one take we could track them traditionally so that we can do harmonies and stuff.” I love harmonies, so of course I readily agree. “I was also thinking instead of three songs we could maybe do five? And two of them are duets. Also let’s bring in a cello player.” At which point I spontaneously developed a nervous twitch. Nah, not really. The more songs, the more instruments, and the more involved it got (which wasn’t very, by any recording standards) the happier I was. After all, is it really a job to sit around your own house with people you like making recordings of great songs? Where Holley provides pizza and beer? Working with Holley on a project like this was a lot like playing with a Ouija Board. I’m not sure which of us was driving the letter thingy, but it ended up spelling out “AWESOME”. Suffice it to say that I learned a lot, had a fantastic time, and am really proud of the results. I hope you check out the EP, out today on itunes (click on the album art at the top of this post to be transported directly there).